I built a gallery wall shelf several years ago and to update the shelf, I repainted the frames and added new art. 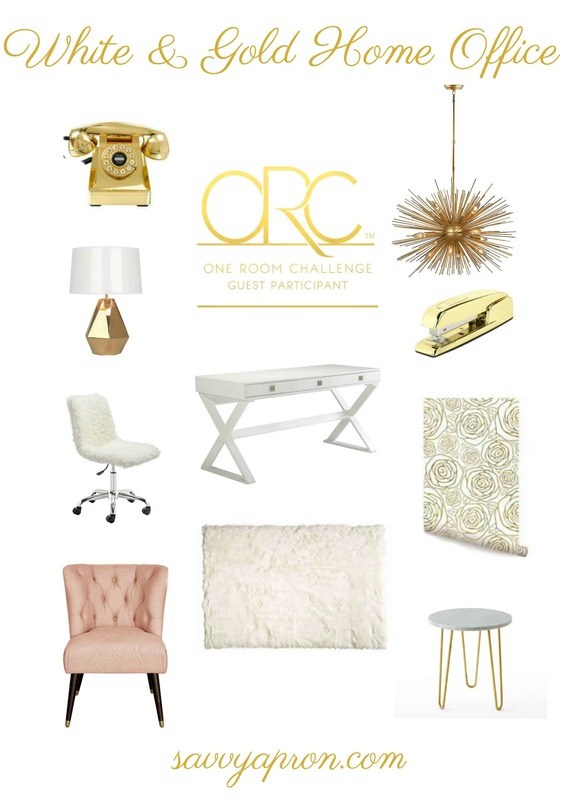 It is week 6 for the One Room Challenge and that means the reveal is next week! 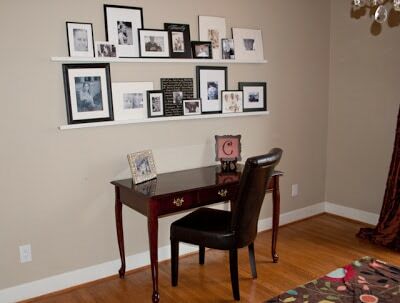 I have chosen to makeover my home office for this challenge and the only thing left is to pick up my new light fixture and install it. Yay! I am in love with this room and I can not wait to show it off! I just want to remind you first that the ORC or also known as the One Room Challenge is a challenge hosted by Linda from Calling It Home and House Beautiful. Over 150 designers and home bloggers with transform a space and show their progress every Thursday. On November 16th we will show our final reveal for our room makeover. You will want to check out all of the participant’s rooms because you will be blown away by the transformation of each room. If you want a recap, you can visit Week 1, Week 2, Week 3 and Week 4. I have had this gallery wall shelf in my home office for about five years. I started with black and white frames and even though my shelf was starting to look dated, I still love it. The picture above is my wall and office is about 6 years old so the pictures of my children needed to be updated. If you have been following my room transformation, you know that my vision is to create an elegant gold and white home office. 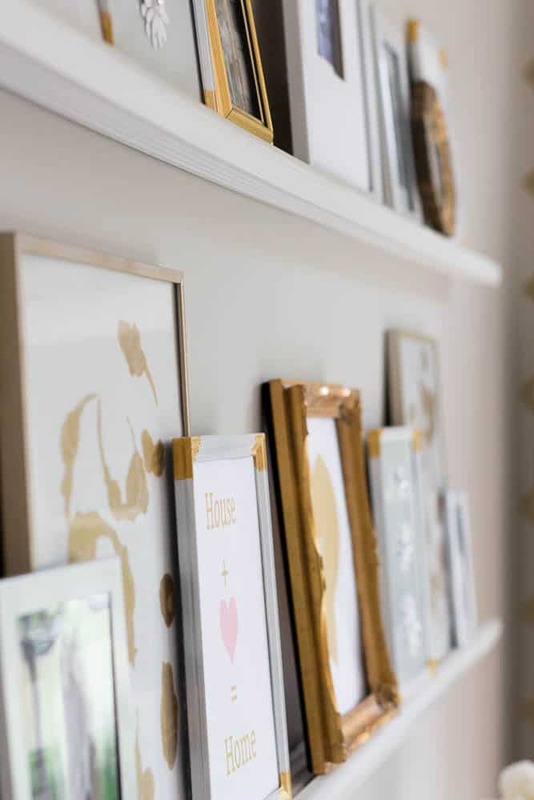 When I started planning my home office makeover, I knew that I wanted to keep the gallery wall shelf but it definitely needed new art and pictures. 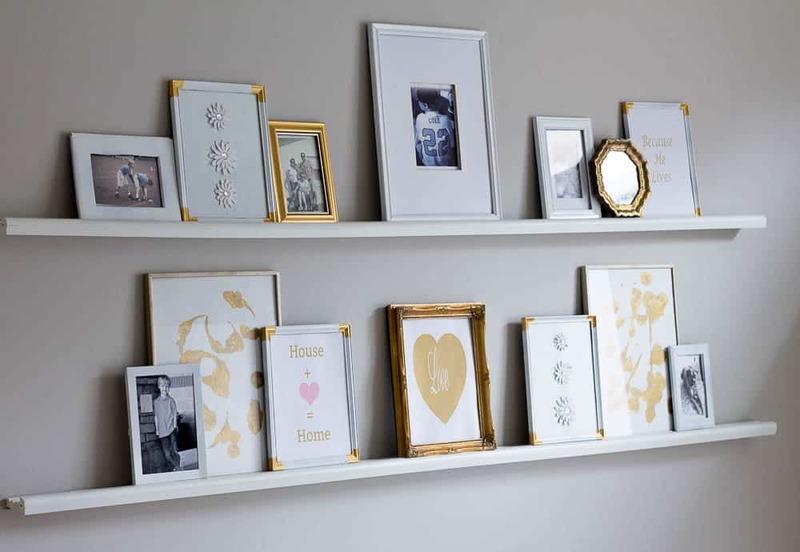 Instead of purchasing new art, I chose to use what I had, repaint old frames, and make a few printables using gold and white. I thought that this would be a great place to save money so that I can have a few splurges with other decor items. I spray painted most of the frames white. I painted the corners of the frames with a beautiful metallic gold paint and I think that it makes these cheap frames look pretty. 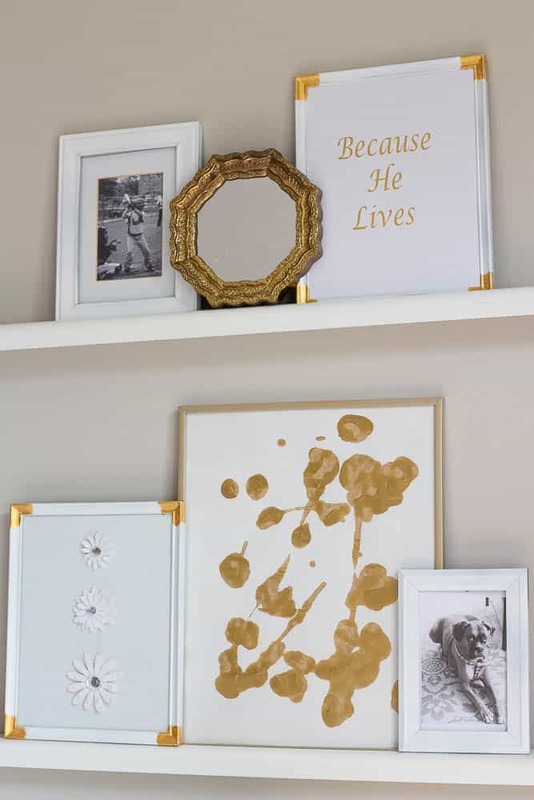 In one of the frames that I painted the gold corners, I added a piece of white copy paper and added some white flower stickers that I had in my craft supplies. 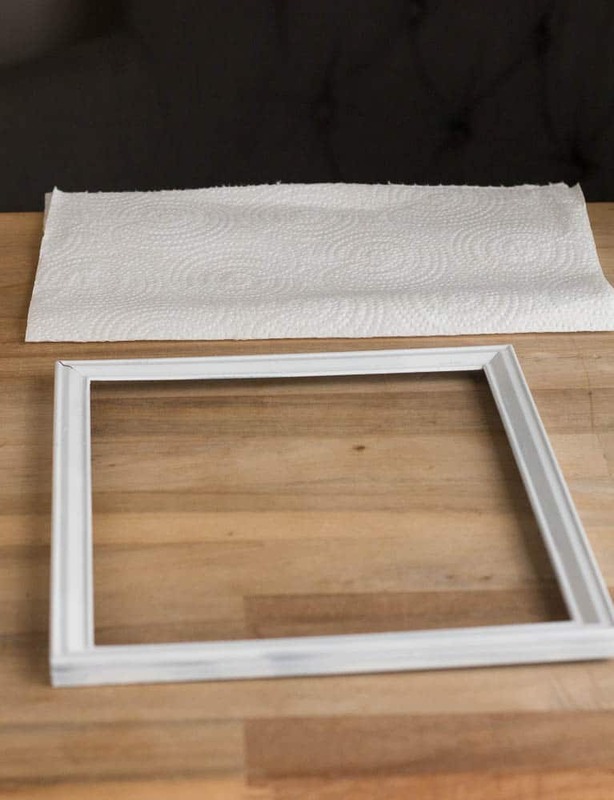 In the other frame, I created a printable and just printed it off and framed it. I did the same thing on the other side of the gallery wall. I also had purchased two gold abstract art pictures at the thrift store months ago and added them to my shelf. For the frame, I chose the words, “Because He Lives” because this is my favorite old hymn and I am always humming it. I love to see the words in my office as a reminder that because He lives I can face tomorrow! I came across this picture in our old photos so I thought I would show you the wood that I used. I purchased the wood from a local Home Improvement Store. 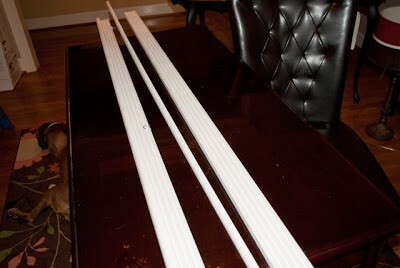 We used 2.3 inch white hardwood window and door fluted casing. We also used quarter round for the edge. I am so excited to show you my new office next week!! The power of paint! I love the way you incorporated your current frames in a new way. And…that little touch of gold in the corners is perfect!! The update with the gold and white look so fresh and modern, I love it! Can’t wait until next week to see the entire room! 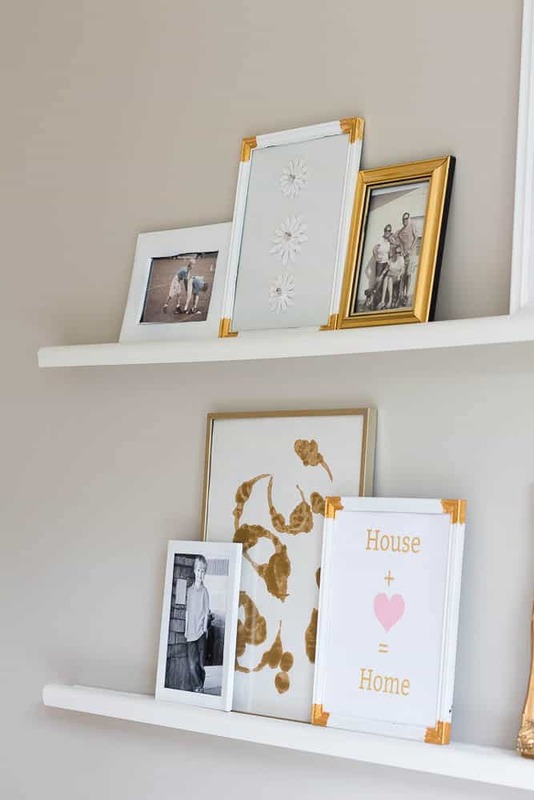 I love the gold edges on the frames, it really gives the just the right touch of glam! I still can’t believe your steal of a desk!!! Can’t wait to see it all next week!! A small update can make such a big difference!! I cannot wait to see your reveal! I know it’s going to be outstanding! !